Anyone want to make an attempt at writing any of these books? If so, they'll be featured prominently in a future blog post. Post them in the comments or email them to me. Last week one of my good friends had a birthday, so I made dinner. The main course was a tofu stir fry, it is really good and I wont go into details except to say that is was based on a recipe of my mothers. The desert though, that is what I am here to tell you about. 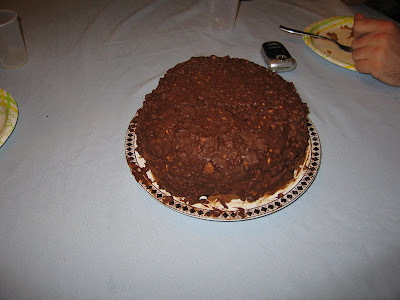 It was a chocolate cake, but not the chocolate cake I normally make. 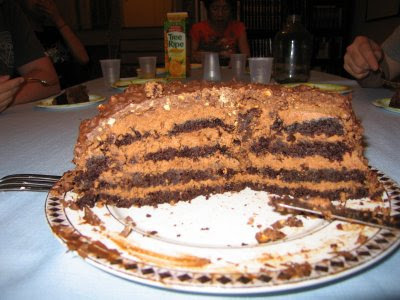 This was the first layer cake I have ever made, and the filling in between the layers was a chocolate hazelnut mousse. To top it all off, after I covered the entire cake with the mousse (which was amazing in its own right), I had one last topping. A milk chocolate covering that had some peanuts chopped into it like a Mr. Good Bar (although I made it by chopping some peanuts into the melted chocolate). Well I hope you are drooling, and both my parents a bunch of my friends have already had it, and I am saving peaces for my brothers and Stacy. Of course the obligatory picture of the cake before it was cut. And here it is cut, so you can see the layers. Google has made quite a few labs features for Gmail. There are a few which I have found to be infinitely useful. This is my number 1 favorite feature of any email program of all time! "Stop messages from being sent for a few seconds after hitting the send button." It seems like a silly feature but I've used it countless times - almost all in very critical situations! For the obsessive emailers among us, "Changes order of elements in the browser title bar from "Gmail - Inbox (20) - ****@gmail.com" to "Inbox (20) - ***@gmail.com - Gmail". This way you are able to see if a new mail has arrived even if Gmail window is minimized. "Email for the truly lazy. Save and then send your common messages using a button next to the compose form. Also automatically send emails using filters." I've never actully needed this one, but one day I'm sure it will come in handy. "Prevents you from accidentally sending messages without the relevant attachments. Prompts you if you mention attaching a file, but forgot to do so." This feature has already graduated labs. Any time I get a message I would never care to read right away, I filter it so the next time it skips my inbox and gets labled. "Adding attachments while in Offline or Flaky mode is currently not supported. "We know this is tooootally lame. But don't forget, Gmail didn't have basic stuff like drafts when it launched. We'll keep working on it." 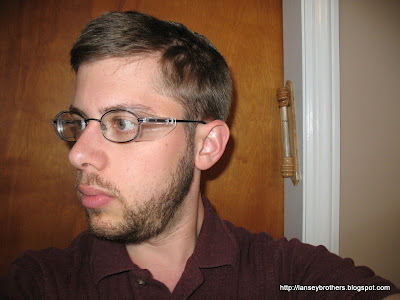 Recently, when cleaning for Pesach, I came across some old pairs of glasses. 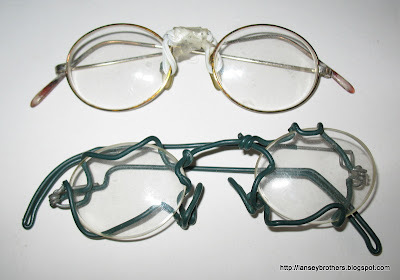 So I thought I'd share a look at my historical eyewear. 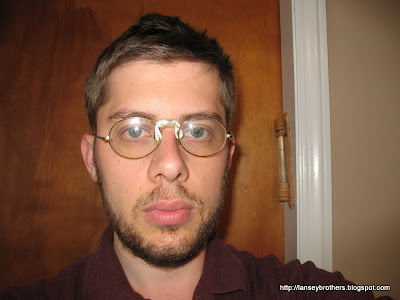 These are my current glasses. The side-shields come off for daily use, but I attach them on occasion when I'm working in some labs or just want to protect my eyes. 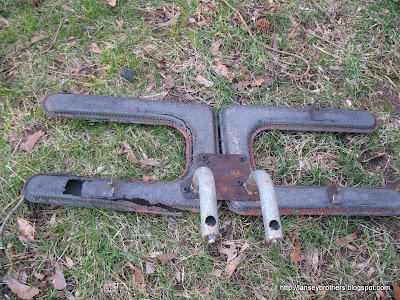 I can't seem to find the set that preceded these, but they looked basically the same, just didn't have the clip-on side shields. I think I wore these glasses for the longest time. They are made of those "memory metals" and, when bent, just snap back to their original shape. 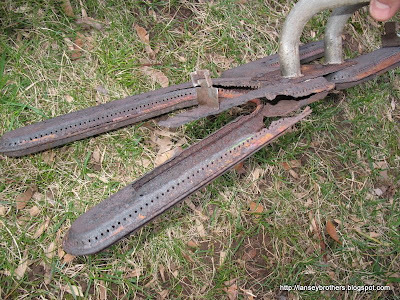 I used to enjoy showing off how durable they were by twisted them into knots. Surprisingly, that's not what eventually broke the bridge...it was a basketball hitting my face (and people wonder why I don't like sports). After the initial breakage, Yoni jury-rigged a fix: He soldered a piece of a wire shirt hanger (also useful for TV antenna replacement) behind the bridge (I seem to recall that Uncle Sysfrog was there at the time offering moral support - can anyone confirm this?). This was a nice fix and didn't look nearly as dorky as the twist ties. But, eventually, that broke and I fixed it without a soldering iron. This is less exciting, but there was a point when I wore contacts. 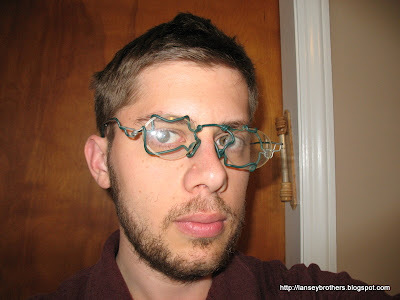 I don't know what happened to the original frame that these lenses were in. I think they might just be an old prescription from the twist-tie set. In any case, this is another example of Yoni's handiwork. I don't think I ever wore these regularly, or just kept them as an emergency backup set. Here's a closer shot of the older frames. Some of you may be familiar with my out of age old Microwave Cookbook from the blog, it is apparently a never ending source of entertainment . . . and not reading the recipies. When googling my name one day I happened upon a curious website that is apparently selling my cookbook for, £48 which is a little over $70. 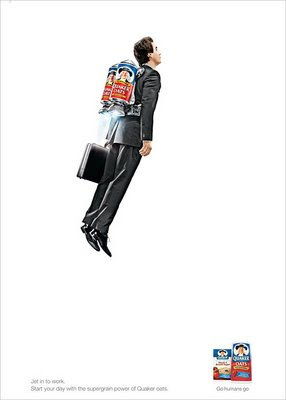 See the product page here. It is quite interesting to note that this "book" has been "registered" with ISBN: 153773786 and they have no less than 89 in stock! Any thoughts if that is the cover of my book they show there? It has come up in the past though, when somebody wanted to "order a copy of this cookbook"
It turns out that a digital copy of this cookbook is completely free online here. Now if you'd like a hard copy, I would be more than happy to print it out on some nice paper then mail it to you personally, for pretty much the price of a stamp. So Mrs. Person, what do you say? I was hopefull to make the sale, but in the end she wasn't interested enough to spend the $0.45 I asked for. In afterthought I probably should have just mailed her one considering she is one of my only fans. 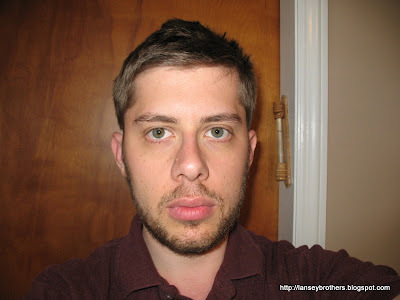 Well in case you have not noticed from any of the pictures of me on the this blog of late, but I am rather overweight. About a month ago my birthday passed, and I was fed up about my weight so I decided it was time to loose weight. To reach this goal I created the Great Falafel Diet, yes you heard right I plan to lose weight by eating tons of falafel. Falafel is a deep fried Middle Eastern dish, however no one said you have to deep fry it. Hence arose the falafel pancake. 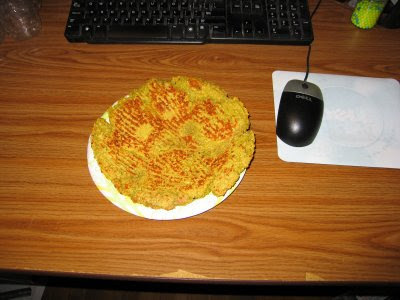 The falafel pancake is an eight inch across one half inch thick falafel that is pan fried in about one tablespoon of oil. Believe it or not, but that only contains about 400-500 calories. It is filling, tasty and because of all the spices it suppresses the appetite. Since the end of Passover I have lost more than 15 pounds. I do eat other things as well, but everything in moderation and no sweets, no cakes, and no cookies so pretty much all the things you know you shouldn't eat. I also exercise every morning for about an hour. An additional thing that is good to eat is healthy soups. 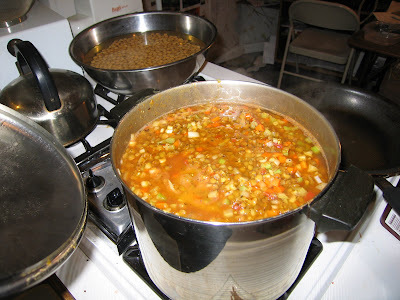 The reason I am up and posting now is because I have a pot of lentil soup on the stove cooking. The pot also happens to be an 8 quart pot and it is almost full to the top, but the whole pot is still only around 1400 calories which if your serving size is 2 cups, each serving is only 87.5 calories. Just because I am dieting, doesn't mean that I cant eat good tasting food. Note in the background is a metal bowl full of chickpeas soaking, for tomorrows falafel batch. There was some amount of difficulty associated with this soup though. My parents are currently up in the Poconos, and my mother took the chefs knife with them. 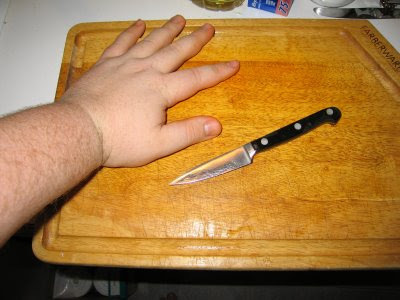 This left me a problem, I needed to dice a ton of vegetables and I did not have the good knife for it. I should have used the food processor, however I decided to do it by hand with a paring knife. This may not mean much to you however here is a bit of a sense of scale here. With that little knife, I fine diced a parsnip, 6 big stalks of celery, 5 large carrots, and 3 onions. Needless to say it took a while. You may remember me mentioning a future paper in my talk at Google, well my paper is finally out, but I don't think anybody read it. My co-author Bruce Bukiet once said "Math papers are read by an average of 0.5 people" and I think that the average for Quantitative linguistics papers is somewhere around zero people. Not even my own mother read it. I couldn't find it on Google Scholar until I realized its just ranked so low that you need to be uber-specific to find it here. You can read the abstract on the Taylor and Frances site here. You can see all the raw data here. Or if you are feeling especially sympathetic, you can read the actual paper here! Please please, it would be really nice if somebody took a look at what I wrote and made a nice comment about the material.